Well that title certainly sounds fancy and complicated doesn’t it, but it’s not really. It is also less of a planned meal and more of a “we have this in the refrigerator and I have a craving for that” meal. 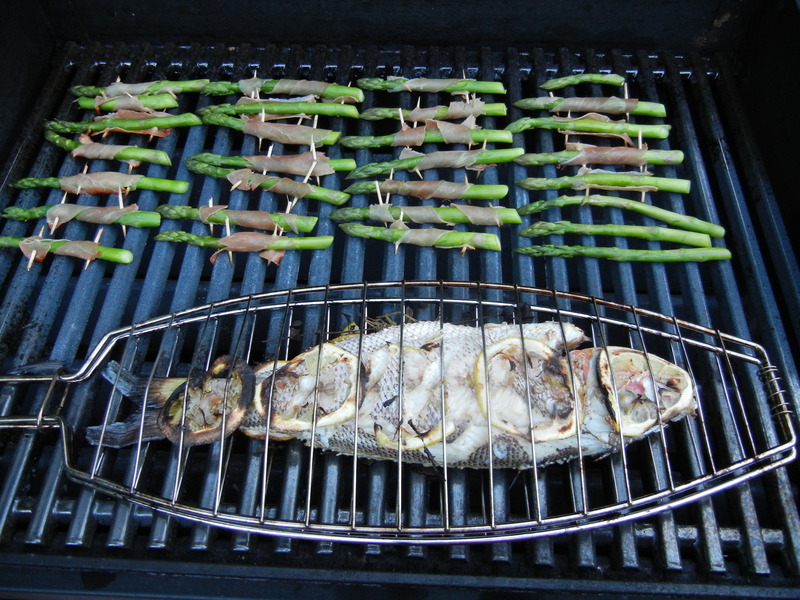 To start with, I have been cooking whole fish on the grill for a couple of years now. I got the bug during a trip to South Beach in Miami where I had a whole grilled Yellow Snapper and it was SO GOOD, that I had to try it at home. It was intimidating the first time, but really was not that difficult. So I thought it would be a good thing to post here and perhaps give someone else the confidence to try it. Now in addition to the cooking challenge of getting the fish done without burning it, you have the YECH factor. There are a lot of people that have trouble seeing and handling a whole fish. And that can get worse when it comes off the grill… But there are ways to get around that too, so here we go with my tips for cooking a whole fish on the grill. The first step is to acquire the fish. The advice I always see in cooking magazines and online is that “the fish should look and smell fresh”. Great, what exactly does that mean? Well, the eyes should be clear, not cloudy, and it should look firm not “old”. But the best test is the smell. Remember it will still smell like fish, but it should not smell like fish that has been sitting in the trash can overnight. I’m sure you can imagine that smell. And of course there are lots of variations in between. I find it best to go with you gut. If it looks and smells good, go for it. The second step in acquiring the fish is to have it cleaned. Most fish shops and fish counters will do this for you. This involves them removing the fish’s “plumbing”, scales (if not already removed), extra fins, etc.. They will also remove the head for you if you would prefer not to look at fish eyes during your dinner. Once cleaned, your fish is ready for dinner prep. In terms of quantity, I usually get 1 fish per person for small to medium-small sized fish (think trout, branzino, etc.). For larger fish that are medium to large (like rockfish, snapper, etc. ), I usually get 1 fish for 2 people. 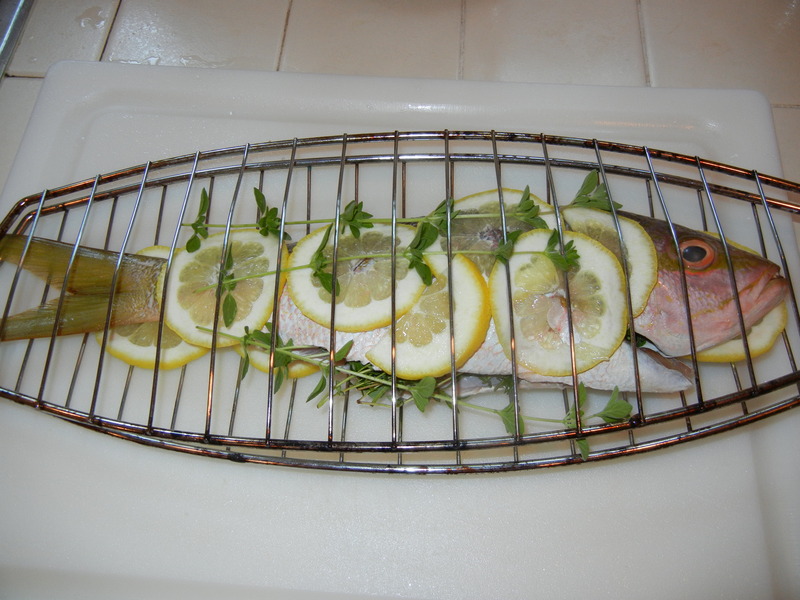 I use a wire fish basket to cook the fish on the grill. It lets the fish get some direct heat, but holds it together on the grill. I start by rinsing the fish off, outside and in. Then pat it dry. I read somewhere that cutting a couple of slits in each side of the fish is a good idea, so I do that also. 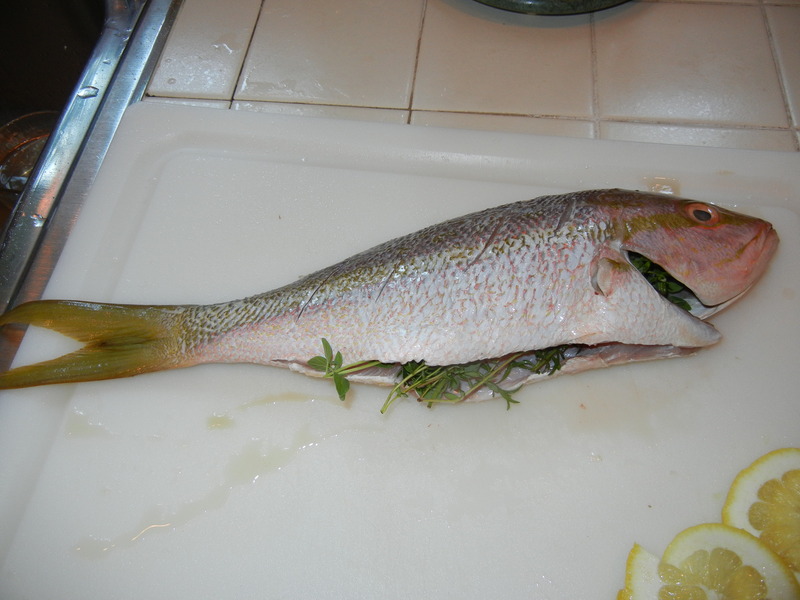 Next I rub the fish, inside and out with olive oil. I like to use a lemon olive oil to add some extra flavor to the fish. I also slice a lemon into thin slices to place on the outside of the fish. This helps protect the meat and give it a little lemon flavor. I pull some herbs from the garden, usually some mixture of oregano, thyme, marjoram, savory, tarragon, etc. Nothing really strongly flavored. I rinse and dry the herbs, then stuff them inside the fish cavity (where the plumbing used to be). Now it is time for cooking. I preheat the grill and before putting the fish on, adjust the heat. In the area where the fish will sit, I turn the heat down to low. The other burners I set to medium. I find that using indirect heat lets the fish cook all the way through without burning and charring it. I try to only flip the fish once, twice maximum. Each time you flip it, you have a chance that a chunk will break off and fall into the grill, so try to limit the flipping. Telling when the fish is done is a little tricky. I usually take a small knife or fork and pry open the fish a little to see if it’s cooked through. When it’s done, it should be flaky and opaque. Be careful when pulling the fish basket off the grill. Even though it has a handle, I have some burn marks from touching part of the wire basket. I find that the fish comes out of the basket easier if you let it sit for a short time, maybe 5 minutes. It is also easier if you sprayed the basket with oil. I always try to filet the cooked fish on the plate, cutting the meat off the bones. But it never works out very well for me, and I end up pulling off chunks and serving those. This dish is a great appetizer, but we had some Prosciutto and I had a craving for a salty vegetable to go with the sweet mild fish, so a dinner idea was formed. This is really easy to make too, and can be made on the grill with the fish. First you clean and trim the Asparagus. I usually trim off the bottom third of the stalk where it is most tough and woody. 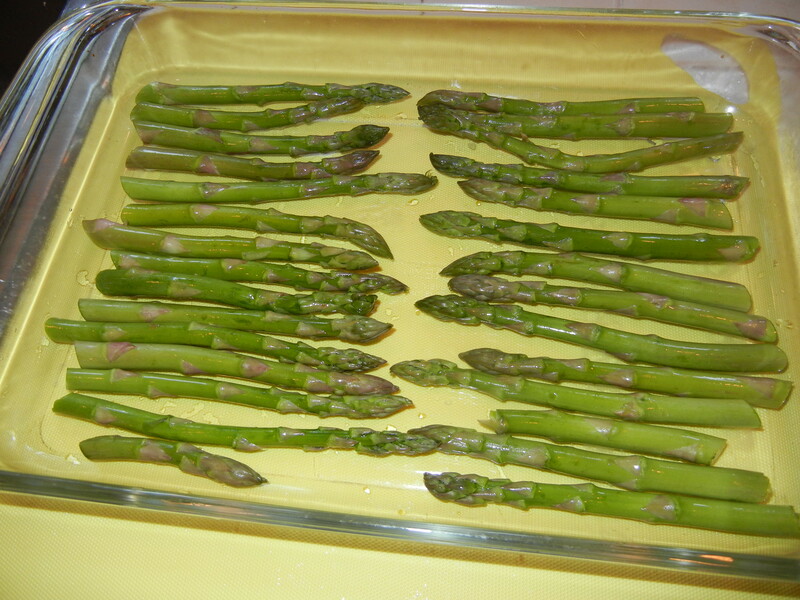 I put the Asparagus into a glass microwave safe dish, cover with plastic wrap and cook for 1 minute, 30 seconds. If you have more Asparagus or thicker ones, you may need to cook them a little longer. The goal is to only cook them slightly, leaving them still firm. Once they are done, you need to let them cool down. You are also going to need some toothpicks (I usually break them in half). 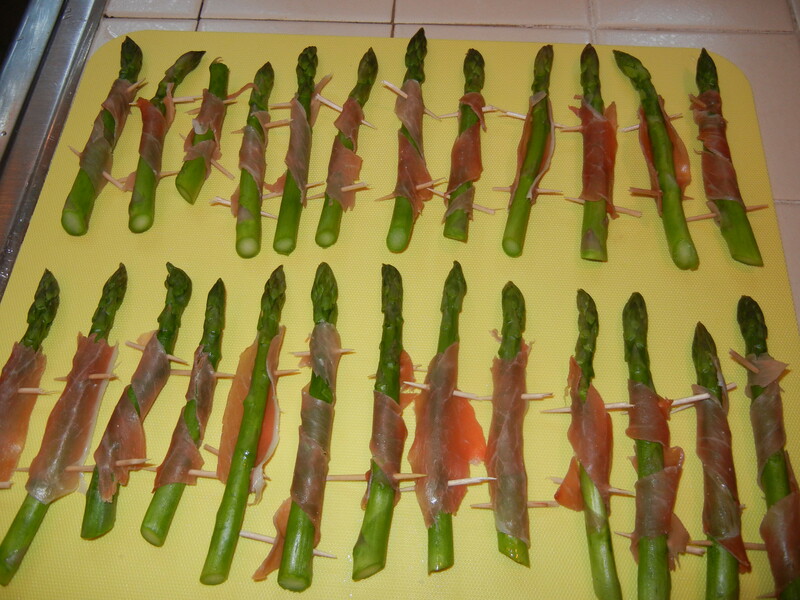 And you need some Prosciutto cut into thin strips. Once the Asparagus is cool enough to work with. Take each stalk and wrap a piece of Prosciutto around it (like a candy cane stripe). Secure both ends with toothpicks and set it aside. When you are done, place them carefully on the grill. You need to watch these closely so that the Prosciutto does not burn. You also need to rotate them trying to get all 4 sides some grill time. Once they are browned, pull them off the grill. 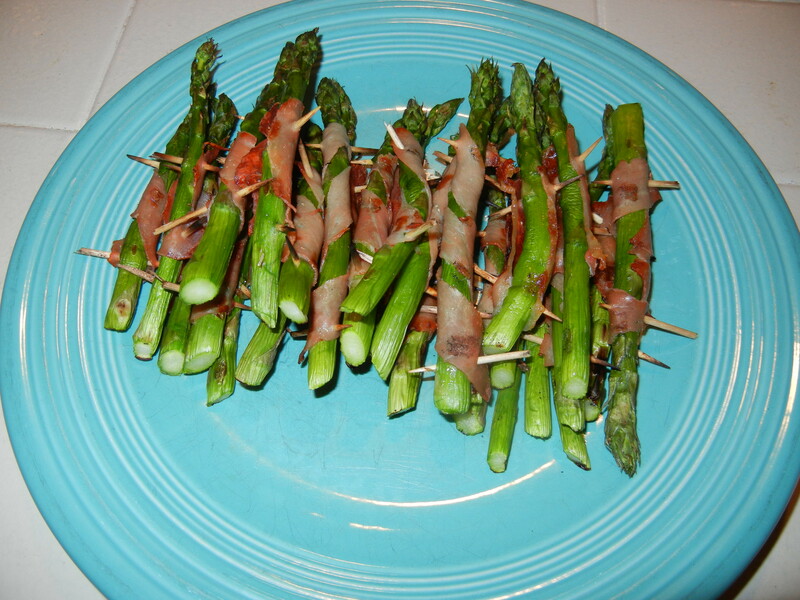 These are good by themselves, providing a smoky, salty flavor to the Asparagus. They are also good with a dipping sauce, such as an Aioli. And as I mentioned, they make a great party appetizer. So how did this odd meal turn out? Well the fish was really good. 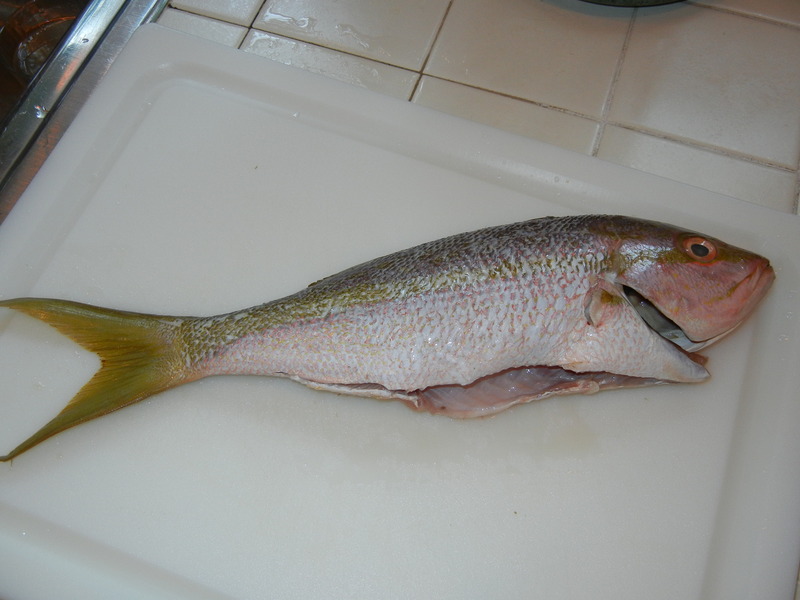 Yellow Snapper is a light fish, but it actually has some flavor. And the lemon, herb combination plus the smoky grilling made for an excellent taste. The Asparagus was also very good. Having a little salty flavor with the fish was a good pairing. I would definitely do it again. For a wine paring, I picked out the Villa Creek 2010 White. 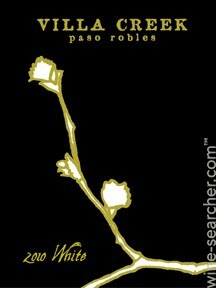 It is a blend of 65% Grenache Blanc, 30% Roussanne and 5% Picpoul Blanc. This is typically called a Rhone White, because white wines with some mixture of Grenache Blanc, Roussanne, Viognier and Marsanne are made in the Rhone Valley in France. These wines are really good with food. They have wonderful flavors like peaches and honeysuckle, and usually are not as oaky as a Chardonnay. The versions from California, particularly the Central Coast area are very good and reasonably priced. The sweet, fruity flavors of the wine paired really well with the fish and were a nice compliment to the salty Asparagus. 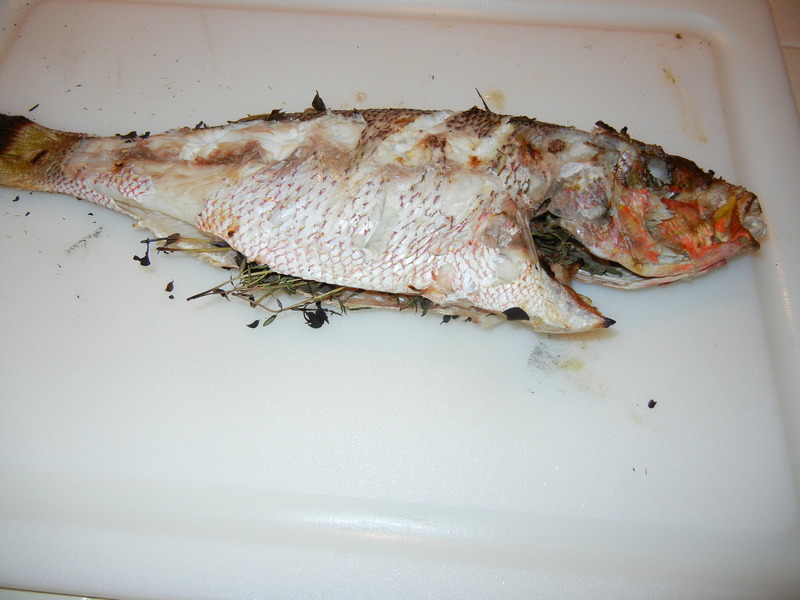 I hope with the pointers in this post you will take a shot at cooking a whole fish at home. It is very good, and makes for an impressive presentation at the table. If you do, let me know how it goes and pass on any pointers!